As from 1st October 2017 a decision was taken to merge our two existing WEB Sites www.hollyandtheivy.co.uk and www.minijarcompany.co.uk. Now our new and existing customers can select our Artisan Products from a single WEB SIte making selection simpler and also allowing us to keep our WEB Site more up to date. Unfortunately existing customers who had accounts at www.minijarcompany.co.uk will have to create a new customer account at www.hollyandtheivy.co.uk and previous order information will not be available to view. Sorry for this inconvenience this may cause you. Our award-winning, handmade, gluten-free products are carefully made in small batches to retain color, texture and flavor. We only use the finest and freshest ingredients sourced locally from within the Farmers Market Group we belong to where possible with nothing artificial added making all of our products suitable for vegetarians and vegans. 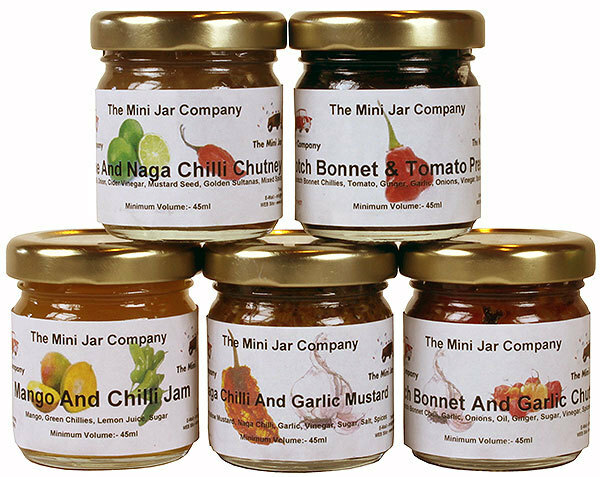 Our products range from our Mild Chilli Chutneys and Preserves through to our very specialized unusual Preserves, enabling you to enhance and enliven any dish you create to your own personal taste.